A skin allergy is when skin shows an atypical change because the immune system reacted to something that is usually harmless. This is called an allergic reaction. 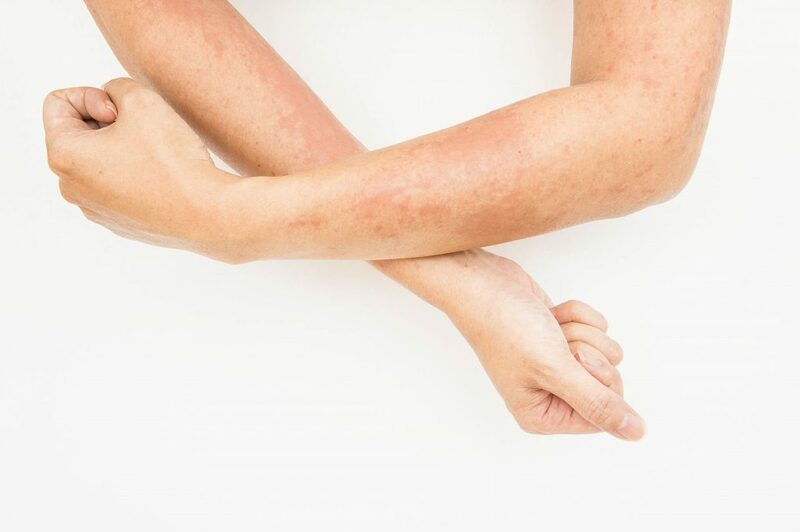 The most common allergic skin conditions are eczema (atopic dermatitis); rashes where an allergen has touched the skin (allergic contact dermatitis); hives (urticaria); and swelling (angioedema). Eczema, known medically as atopic dermatitis (dur-muh–tahy-tis), is when the skin becomes easily irritated, itchy, and dry. It is the most common allergic skin condition. Although eczema is more common in children than adults, it can occur at any age. Eczema is linked to both genetic (inherited from parents) and environmental factors. It is connected to asthma, food allergies, and seasonal allergies. In addition to a direct allergic reaction, there are other things can make eczema flare up, such as certain foods, stress, soaps and lotions, or cold and dry air. Allergic contact dermatitis is when something touches the skin and causes a reaction. For example, some people may discover an allergy to a personal care product, such as a lotion or deodorant and experience a rash at the location of application of the product. The reaction most people have from poison ivy is this type of allergy. The oil in poison ivy causes allergic contact dermatitis in most people. 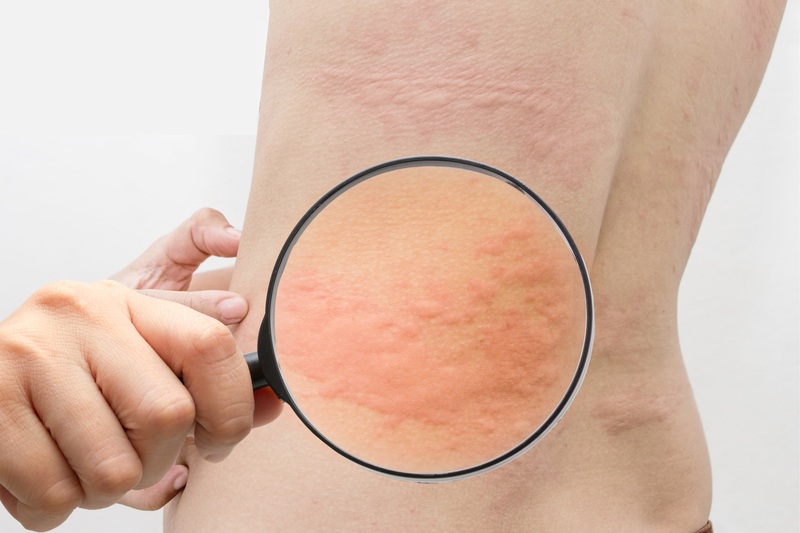 Hives, or urticaria (ur-ti-kair-ee-uh), are raised bumps, welts or wheals that form on the skin because of an allergic reaction. Many things may cause a hive reaction, such as eating a food to which a person is allergic, a reaction to a bug bite, certain infections or reactions to medication. Swelling deep in the skin, or angioedema (an-jee-oh-i-dee-muh) is an allergic reaction on the skin. It is most common on places like the lips, eyelids and throat, but it can happen in other spots, too. 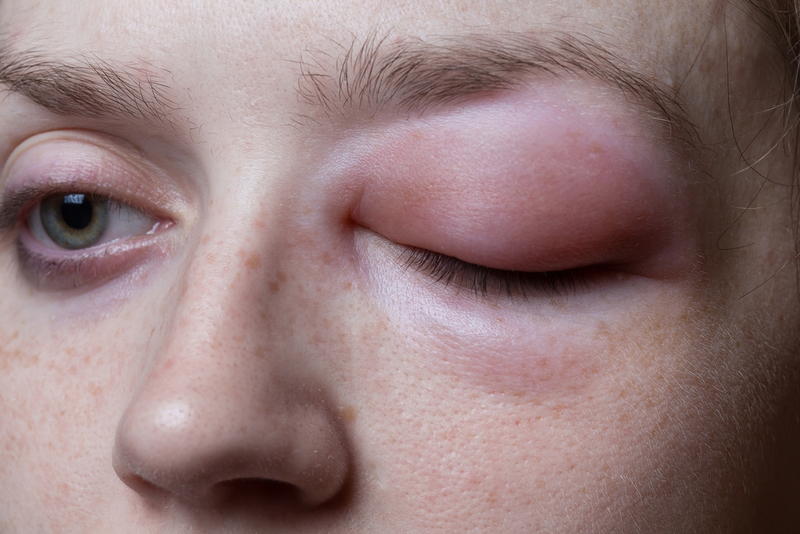 Angioedema often occurs alongside a reaction of hives. There are also non-allergic causes of angioedema that may not be accompanied by hives. Some of these reactions may seem minor, or simply irritating. However, these reactions may be a signal of a larger problem, some maybe even life threatening. Consulting your dermatologist immediately is wise. If any of these symptoms are accompanied by swelling in the throat or mouth, or difficulty breathing, call 911 or get to an emergency room immediately.